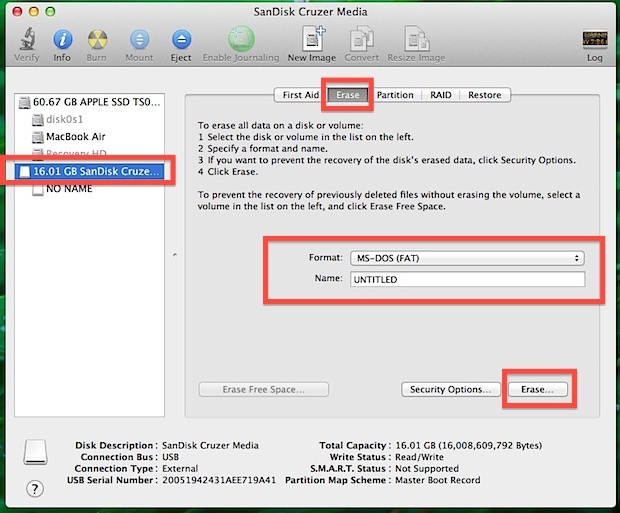 If you want to insure full Mac compatibility of a new external hard drive or flash disk, you’ll want to format the drive to the Mac OS Extended filesystem. This is particularly necessary for purchases of generic PC drives, which almost always come preformatted to be Windows compatible rather than for Mac OS X. Yes, connecting an external hard drive or USB flash key to a Mac will generally read and work fine as is because the Mac can easily read other filesystem formats, including Windows MSDOS, FAT, FAT32, ExFat, and NTFS formats, but unless you intend on using the drive between a Windows and Mac machine, formatting it to be entirely Mac compatible filesystem is highly recommended, and necessary for Time Machine and to make disks bootable. If you have never formatted a drive before on the Mac, don’t worry, it’s super easy and we’ll walk you through the entire process. That’s all there is to it, the drive will now format and erase everything on it. Smaller external hard drives, SSD’s, and USB flash keys format quickly, while a larger hard drive may take a while longer. When completed, the drive will be formatted to the Mac OS X compatible HFS+ filesystem. Should you intend to make an OS X installer drive (for OS X Mavericks, OS X El Capitan, OS X Yosemite, etc) or create any other bootable Mac OS X volume from a drive, or use a new drive as a fully compatible Time Machine backup drive, you will also need to complete this process. The process of formatting a drive to be compatible with Windows PC and Mac OS X requires a different format choice, but is otherwise quite similar. Note that Windows can not read/write HFS+ so if you have any Systems running Windows or friends who you might borrow a USB stick or external HDD they will not be able to access these media if formatted to HFS+ (except if they install software like MacDrive which enables to read/write HFS+ media from Windows). I did this with a WD 1TB, but it took me 600 MB of space!!!! While the proportion of 600MB to 1TB is 0.06% is small, it is not even close to the proportion between the sun and a mouse. Say a mouse is about 10cm long while the sun 1,400,000km in diameter, and the proportion of a mouse to the sun is 0.00000000714%. You might want to be mathematically more precise. What if that USB drive has U3 software on it. I read that you can ruin the USB drive if you don’t do it in a special way. Help – new mac user. If I want to read files, videos etc on a mac, that I loaded onto my hard drive through a pc, how can this be done? If you’re intent is to only read files loaded from a pc from a mac, the standard windows NTFS format should suffice. As the article mentioned, this is one of the common formats in external hard drives. If you want the ability to read and write in both windows and mac, format to the MS-DOS (DAT) format. Oh my gosh. Thank you. Thank you. Thank you. I have been fighting with a Click Free external drive (just plug in and it’s done!) for over a week. I have contacted customer service. I have reinstalled NTSF whatever. error. error. error. I was going to mail it back this morning. I just did what you said and it is now backing up. Keeping my fingers crossed but SO relieved! Can check this off my list and move on. OMG THANK YOU SO MUCH – so easy an quick. everything works fine. I have external HD and want to use it with my mac. But I have several pictures on this HD. I want to be able to add folders and continue to put several of my pictures and files on it. WHat do I need to do? I have an external drive and tried going to disk utilities….Erase…Mac OS extended (journaled)….Erase I get an error that it is unable to format. Any suggestions? the external drive is brand new 1TB Tuxera NTSF external hard drive. Yes, you can format an external hard drive for Time Machine this way. And no this is not the Dell site. I purchased a WD my passport 1 TB external hard drive through Amazon.com. What I didn’t realize was that it wasn’t one for mac. Is it okay to keep it and reformat it for mac or am I much better off returning it and buying another one specifically for mac? 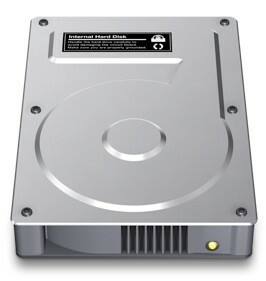 Yes just format the drive for the Mac as described in this article on formatting an external hard drive to Mac OS X compatibility. i tried to do this and it failed. it would not give me details. The same problem – trying to reformat my flash drive and I keep getting failed response – first erased free space and it came up with an error/reason it couldn’t work – the second time it said “A disk with a mount point is required.” Then I hit plain old “erase” and it tells me it “couldn’t modify partition map.” Help? Volume Erase failed with error: Couldn’t modify partition map. so i just did everything what it says, and now my tv cant read my usb. what should i do? The Disk Utility has changed, you might want to update the screen shots to reflect the new version, the Partition tab is noticeably different. I want to use the pendrive and hard drive on both OS’s so which settings should I have to use ? Just bought a 4TB Segate Drive for my Mac to use with Time Machine . . . when I try to use disk utility . . .
Click on the “Erase” tab across the top . . . It Fails and says: Disk Erase Failed. Couldn’t Unmount Disk . . . . what can I try to reformat this disk? Try a different USB port and make sure the hard drive USB is plugged directly into the Mac and not through a USB hub. For whatever reason the Mac commonly struggles with USB hubs, I think because they are not powered. I get similar errors constantly when using USB hubs on Mac with external drives, but when plugged directly into Mac the hard drives work. Also make sure the external drive is not locked. Having the identical problem connected directly to USB on the back of iMac. Since the Disk Utility changed I have not been able to reformat Seagate drives, Western Digital are fine. How do you tell if it is locked? I have a new maxone external drive, and it is not recognized in the left-hand panel of the Disk Utility. It is connected by USB cable, plugged directly into mu iMac. I have an Iomega Ext. drive with files from a Windows based PC that I want to keep. The storage is half full with over 567MB of storage left. Am I able to continue with the formatting without erasing the current files that are already on it? I have a 1TB Toshiba external hard drive, I have been using on my iMac and have been able to read an write on it. I recently purchased a macbook pro and tried to write on the external drive but it won’t let me. Why is it working on my iMac and not on my macbook pro? It seems that the hard drive is formatted for Windows but it does work (read and write) on my iMac. Do I need to format this external drive to be able to use in more than one Apple computer? I’d appreciate your help! Majority if not all flash drives come not only with Windows dominant file systems, but also MBR formatted, vs the Mac where the operating system is always installed to a GPT partitioned disk. Format for Mac compatibility as described, I use it with every disk. You do not need to mess with schemes, this is not Windows. This is Mac. You use MBR or GPT depending on what you want the drive to do. In this case you are formatting the drive to be Mac compatible. This is not about Windows. If I already have files on the external hard drive, will “erasing” it permanently erase the files or just erase them and then automatically re-download and format them? Just trying to figure out if I need to back my pictures up to a second hard drive before I do this. Backup everything you want to save. Nothing is left on the external hard drive after formatting is completed. If I want to send a flash drive/flashstick to someone (who has a MacBook) with video files (from a MS-based laptop) already on the drive, will that person be able to format the flash drive retroactively for her/his MacBook? THANK YOU SO MUCH!! I was beating myself up about accidentally buying a 2TB hard drive for PC instead of Mac, and now I’m so relieved! Still works and I’m on a 13 inch retina MB Pro working on Yosemite (i’m too lazy to update). This post is a lifesaver even 5 years down the track! If you format a hard drive it erases the data on it. That is what formatting does, it erases a drive. It does not “ruin” anything, but it does remove the data on it. What else do you think erasing a drive is supposed to do except erase the data? I have a Mac, the HDD failed, so I had to get a new one. At the moment, I have access to a Windows 10 PC, how do I create a bootable USB for the Mac, using a Windows 10 PC? I purchased a 4TB WD external drive and having a heck of a time reformatting this drive. I have tried all the above advice without getting to have this new hard drive formatted. Any other suggestions? I just keep getting the error Disk erase failed. same here. can’t figure it out either. Erase and then the drive is no longer mountable and can’t be repaired or partitioned. I’ve had a USB for a few months now, and it’s proven to be reliable, if hard to connect. At one point, however, it uninitialized itself and now I can’t access the 5+ gigabytes it still has on it. Is there an option besides just declaring the data irretrievable, and more importantly, how does a USB uninitialize itself? Thank you sooooo much!! What a relief!! Had been struggling!! Why after format the computer shows “The disk you inserted was not readable by this computer” Thank you! I am Computer-Eleteret lol. My Husband bought me a “Tara-Bit ” Hard Drive to put All my pictures on Before I blow Up my Mac,Like I did with our H.P., He Even put in an “Extra”500 gb. Hard Drive in it & My pictures still over loaded The Thing. Now My Mac is about There. I keep trying to get 1 of my Brainiack kids to Help Me Set Up My “Tara Bit” Extrnal Hard Drive. I just have no Clue how to do it. And Can Not Seam to find a Easy Manual for Dummies like Myself set it up “Format” ? PLEASE HELP,Before I run out of space on my mac, Real Close. How do I unlock my Apple MacBook Air with my pen drive?